In TPoI this week, we see a sneak peek at the Nintendo Switch, mobile esports comes on the scene, and Microsoft releases news that we can expect to see an update at E3 regarding Project Scorpio. Although details regarding the Nintendo Switch have been kept under wraps by Nintendo, Switch fans eagerly awaiting the console’s launch were treated to an early look at the product this week thanks to one lucky gamer who uploaded videos of their new Switch and its system menus after receiving an early shipment from an undisclosed retailer. Polygon reports that the user interface and system menus have been carefully guarded by Nintendo – though it’s no longer a secret as the video garnered over half a million views in just two hours. According to Business Insider, the short video shows a notable improvement in the Switch’s processor speed and responsiveness from previous handheld consoles. With this level of hype surrounding the Switch, the console may very well outperform some analysts’ projections of 40 million units sold through 2020. In the meantime Switch fans… keep waiting. With the popularity of games such as Call of Duty, League of Legends, and Defense of the Ancients 2, esports has reached a golden age of success and viewership. However, teams such as Fnatic have refused to limit themselves to console and PC games and are beginning to branch out towards popular mobile games such as Vainglory. Fnatic’s growth into the mobile gaming industry reveals the ever increasing popularity and potential of mobile games as the demographic that owns a smartphone is much larger than those who own a gaming console or computer. WIRED reports that Fnatic and others in the esports space see mobile gaming as the next play in esports due to its accessibility and intuitive gameplay. So if you like mobile games and esports, you might be able to tryout for your favorite team in the near future! As E3 draws closer, the gaming world is officially abuzz as companies put the finishing touches on their games and products for the summer event. Earlier this week, Microsoft tweeted an announcement from their official Xbox account regarding Project Scorpio – their next-gen console. 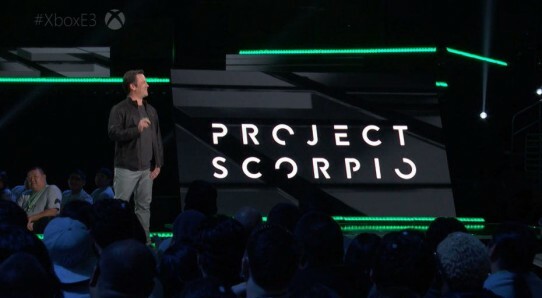 The exact specifications of Project Scorpio are still unknown, but what we do know is that it will have the most powerful GPU installed in a console to date, allowing it to run games in true 4K resolution along with VR capabilities. TechCrunch reported that we’re not likely to learn anything else about the project until June, since the company has been very “mysterious” surrounding the product up until now.